Everyone coming to this site has different trip styles and needs; different items they’re (not) willing to travel without; different health issues and considerations. Special occasions and backpacking trips don’t always mix, but sometimes you can’t avoid it. Here’s how to pack for a special event in the middle of a trip. Rachel went to Costa Rica prepared not paranoid, which had a huge impact on her packing. Here’s a look at her strategies for downsizing for living and working abroad, and how you can do it too. Downsizing for family travel isn’t as tough as it might seem. Rowena tells us how she and her family have found many benefits to traveling carry-on only. Marissa’s luggage evolved from a giant suitcase to a 30L backpack. 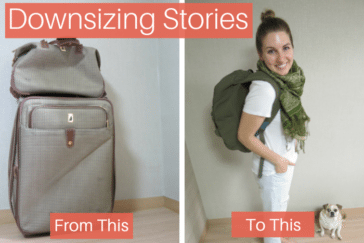 Here’s how downsizing luggage helped her realize she didn’t need as much stuff to travel. Sometimes it’s worth it to pack less and buy it there. Many things can be purchased on the road, and you’ll save space in your bag and avoid baggage fees. Maybe you just want to cram as much stuff as possible into a smaller suitcase. Use these tips on how to pack smaller when weight doesn’t matter. How Long Do Travel Toiletries Last? Many travelers want to know, how long do travel toiletries last? Here’s a look at how many washes Ali got from 1 oz of shampoo, plus input from HPL readers. Do you travel with medications? It can make travel a little tough, but with these tips for packing medications when you travel, your trip should be easier. I kept my 40L backpack light, changed up my wardrobe often and never spent more than I’d originally planned doing it.